Novartis announced today that the US Food and Drug Administration (FDA) has approved an expanded use for Promacta ® (eltrombopag) to include children 1 year of age and older with chronic immune thrombocytopenia (ITP) who have had an insufficient response to corticosteroids, immunoglobulins or splenectomy. The updated label also includes a new oral suspension formulation of Promacta that is designed for younger children who may not be able to swallow tablets. Promacta was approved by the FDA as a tablet formulation in June 2015 for children 6 years of age and older and in 2008 for use in adult patients with the same condition. ITP affects as many as 5 in 100,000 children each year and is characterized by a low platelet count. Chronic ITP, defined as ongoing disease more than 12 months after diagnosis, occurs in 13–36% of children with immune thrombocytopenia. A small number of pediatric patients with chronic ITP may be at risk of significant bleeding. The label expansion of Promacta was based on data from two double-blind, placebo-controlled trials, including the largest Phase III clinical trial in this patient population. Treatment with Promacta significantly increased and sustained platelet counts among pediatric patients with chronic ITP with an insufficient response to prior chronic ITP therapies, and some patients taking concomitant ITP medications were able to reduce or discontinue their use of these medications, primarily corticosteroids. Promacta should be used only in those whose degree of thrombocytopenia and clinical condition increase the risk for bleeding. 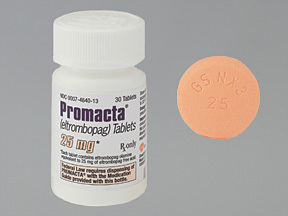 Promacta is a once-daily oral thrombopoietin (TPO) receptor agonist that works by inducing stimulation and differentiation of megakaryocytes (large cells, found especially in bone marrow) from bone marrow stem cells to increase platelet production.